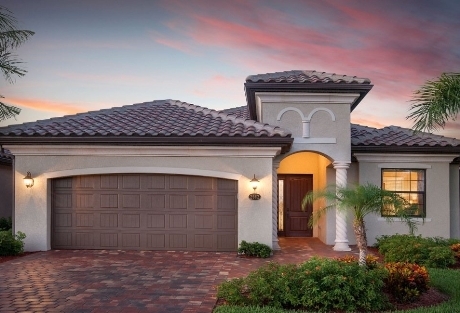 Lakewood National is an exciting, new, gated, bundled golf community being created by Lennar Homes in Brandenton, FL. Key features include Tuscan themed architecture, lakes, lush Florida landscaping and a newly minted golf course by Arnold Palmer Design. Residents of the community’s luxurious homes will enjoy the endless beauty of its fairways and greens. The new neighborhood is tucked into the well-established and nationally acclaimed master planned community of Lakewood Ranch. Send me more information about Lakewood National! Great golf is just the beginning of the lifestyle amenities this new community provides. The planned sprawling clubhouse will feature a state-of-the-art fitness facility, a resort-style pool with beach entry and separate lap pool. In addition, there are eight lighted Har-Tru clay tennis courts, poolside café, full-service spa and more under construction. Homes come with a Golf Membership, so you can begin enjoying world-class amenities right away. Send me more information about Lakewood National! A second Arnold Palmer Design course opened in 2018. The terrain of the golf course is unusual for Florida–with broad, rolling landscapes and sweeping elevation changes. The par-72 championship course offers a wide variety of green sizes, shapes and pin locations. Six sets of tees with multiple tee angles vary the course length from 5,194 yards from the forward set to a challenging 7,184 yards from all the way back. Send me more information about Lakewood National! A second 18-hole championship course by Arnold Palmer Design is under construction. It is scheduled to open in 2018. Choose from a variety of multi- and single-family designs, golf membership included. There are 20 separate floor plans available, offering a design for every price point. Terrace Condos begin with 1107 sq. ft. in the high $100,000’s. Estate Homes range up to 3,800 sq. ft. and are available for more than $800,000. An inviting open concept is a key design element, bringing the dining room and living room together, allowing natural light to pour in via glass sliders and large windows. Send me more information about Lakewood National! Condos ranging from 1107 sq. ft. to 2110 sq. ft. Send me more information about Lakewood National! Explore a wealth of shopping and nightlife in downtown Sarasota and St. Armand’s Circle. The new UTC Mall and many great restaurants are minutes away. Spend the afternoon sunbathing on white sandy beaches. Siesta Key, often rated the #1 US Beach, Lido and Longboat Key are a 30 minute drive. Stroll down Main Street at Lakewood Ranch, socializing with neighbors, catching a movie at the theater, and enjoying year-round cultural festivals. Love Sports? The Baltimore Orioles and Pittsburg Pirates Spring Training is nearby. Tropicana Field home of The Tampa Bay Rays is 30 minutes away. Polo, an International Rowing Lake at Benderson Park, Soccer and Tennis are plentiful. The Sarasota area boasts great saltwater and freshwater fishing. Send me more information about Lakewood National! Sarasota is known as Florida’s Cultural Coast. Opera, ballet, a professional symphony and numerous playhouses are near downtown. Several theaters and art galleries are also located in Sarasota. The John & Mable Ringling Museum of Art is Florida’s State Museum, The Sarasota Film Festival and the Van Wezel Performing Arts Hall brings a wealth of diverse talent to Sarasota. The Ringling Museum, Marie Selby Botanical Gardens, Children’s Garden, Big Cat Habitat, Mote Marine Laboratory, Sarasota Jungle Gardens, The South Florida Museum and more are nearby. As a resident of Lakewood National, all of this will be just outside your doorstep, so home is close by when it’s time to relax and unwind in your own piece of paradise. Send me more information about Lakewood National!